Harry Kane exacts sweet revenge on Piers Morgan with tweet just minutes after NLD victory | The Transfer Tavern | Where football transfer rumours fly or die! Tottenham Hotspur travelled to the Emirates Stadium last night with the opportunity to exact revenge from their north London derby defeat just under three weeks ago, and that’s exactly what they did. Mauricio Pochettino’s wait for his first trophy might just be coming to an end. Spurs will have to see off the challenge of Chelsea over two legs in the semi-final but the manner in which they dispatched of Arsenal suggests they possess the tools to reach the final in February. Son Heung-min fired Tottenham into the lead with a finely taken drive in the first-half, adding another goal to his fine run of form. And the victory was sealed in the second-half shortly after Harry Kane entered proceedings as a substitute. In a goal which bore plenty of similarity to the opener, Kane brought the ball down on the halfway line from Paolo Gazzaniga’s long ball upfield, and he delivered a delicious ball into the path of Dele Alli, who sumptuously lofted the ball over the onrushing Peter Cech. It was a fine finish worthy of stealing the bragging rights, and Kane wasted no time in revelling in the derby glory by sending a message to Piers Morgan on Twitter. 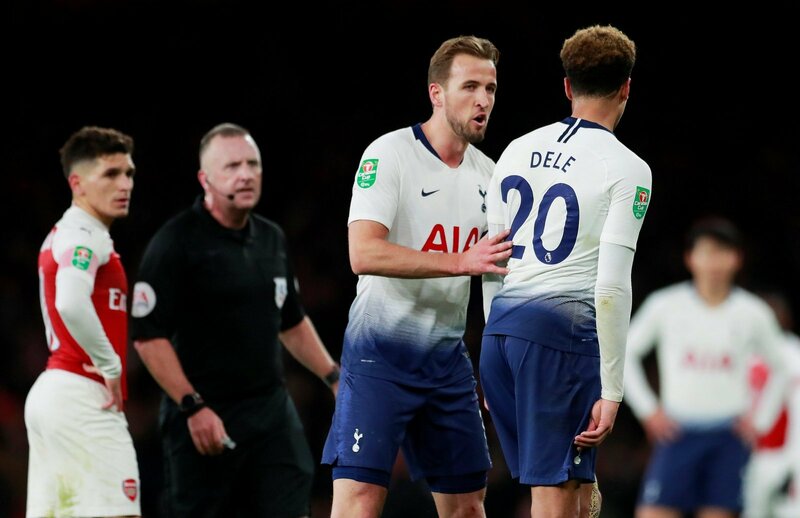 The initial tweet from Morgan was posted shortly after Arsenal recorded their 4-2 victory over Spurs at the start of the month, and Kane clearly couldn’t wait to exact revenge and rub salt into the wound in the public eye. Kane was already firmly established as a legend among the Lilywhites faithful, but his glittering reputation may have spiked after he followed up his game-changing cameo performance with a brilliant post-match tweet.